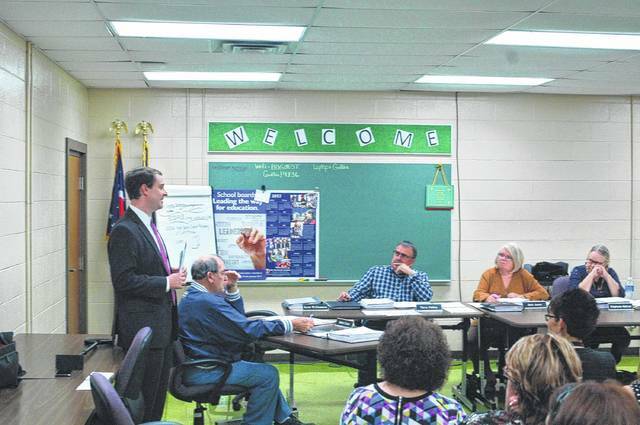 Nick Owens of the State Board of Education, standing, recently attended the board of education meeting for Gallia County Local Schools to discuss education in Ohio and answer questions from the public. GALLIA COUNTY — When the board of education for Gallia County Local Schools recently met, it had a guest on hand. Nick Owens, State Board of Education representative for District 10 (including Gallia County) has made it a personal challenge to visit the local boards of education in his district and connect with the people he serves. Owens discussed several issues that matter to the local district and educators. He has worked to address this issue, particularly in rural schools that he serves. As an assistant prosecutor he has seen first hand the effects of substance abuse, and is taking advantage of his position with the state board to help fight this problem. He explained his philosophy is investing in people as students so that the government isn’t investing in them as adults in jail and dealing with substance abuse. Owens also praised Gallia County Local Schools for its emphasis on community and quality. In visiting with local school boards, he said he’s found that participation is generally higher in rural districts. District grade cards also came out recently, and Owens pointed out that GCLS is 12 percent above the state average for graduation rates, at 96 percent. As a first generation college graduate, Owens emphasized the need for quality public schools and investing in the current generation. “It’s the first time I’ve ever heard in my long career of a state board member going out to the districts,” said Jude Meyers, superintendent. Owens also took time to answer questions from teachers.